From excerpts on the Wikipedia page, the Raspberry Pi is a credit-card-sized single-board computer developed in the UK by the Raspberry Pi Foundation with the intention of promoting the teaching of basic computer science in schools. The Raspberry Pi is manufactured through licensed manufacturing deals with Element 14/Premier Farnell, RS Components and Egoman. All of these companies sell the Raspberry Pi online. Egoman produce a version that is only able to be distributed in China and Taiwan and can be distinguished from other Pis as they are Red and do not have the FCC/CE marks. All of the hardware is the same. 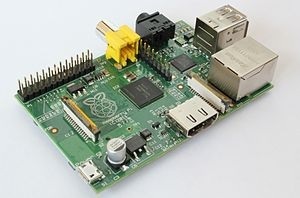 The Raspberry Pi has a Broadcom BCM2835 system on a chip (SoC), which includes an ARM1176JZF-S 700 MHz processor (The firmware includes a number of "Turbo" modes so that the user can attempt overclocking, up to 1 GHz, without affecting the warranty), VideoCore IV GPU,and was originally shipped with 256 megabytes of RAM, later upgraded to 512 MB. It does not include a built-in hard disk or solid-state drive, but uses an SD card for booting and long-term storage. The Foundation's goal is to offer two versions, priced at US$25 and US$35. The Foundation started accepting orders for the higher priced model B on 29 February 2012, and the lower cost model A on 4 February 2013.
now has a 900 MHz quad-core ARM Cortex-A7 CPU and 1GB of RAM. And the best part is that the cost is the same as the original Model B version (typically $35 in the US). The new version now has 4 USB ports as well. My goal for the RaspBerry Pi is to use it to automate various capabilities at my ham station including controlling webcams, antenna switching controls when there is severe weather in my area, and to run a DV Access Point for D-Star. AB4BJ has a great article on setting up a Raspberry Pi for use with a DVAP on D-Star that I used. You can also review my setup of the DV Access Point with the raspberry here. Check out my Raspberry Pi dropdown menu listing in the Single Board Computer section of the menu bar under N8MDP for updates and my Raspberry Pi projects.